Adam’s alarm woke us around 7am, so we had a plentiful five or six hours sleep, which was splendid. We showered (separately), and made our way to the restaurant for breakfast. Things were pretty quiet at this time of day, and we had “kids in a sweetie shop” expressions as we cast our eyes over the pretty impressive array of wares on offer. A little cereal got us warmed up nicely, as we then progressed to the cooked items, which included, quite weirdly we thought, chicken sausages, and finally we have a really big crepe. That’s French for pancakes. First on the agenda this morning was an interview with the manager of the hotel we were staying in (and the one next door) for the podcast. We loitered in reception until she turned up, and Adam had his microphone out and everything. She’s all polite of course, but it turned out she did not want to do an interview….at all. Not to worry, we accepted her offer of a tour around both hotels anyway. Halfway through this I had a horrible sinking feeling that I had left my phone in the restaurant after breakfast and I was ever so slightly distracted for the latter part of the tour, being keen to get back there and find it. Once we were done we quickly dashed back, but with no joy. 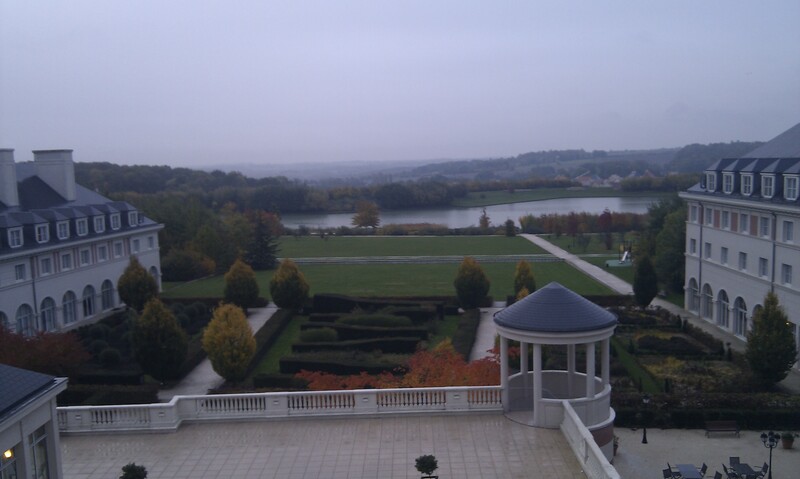 I then realised that I was indeed an idiot, as I must have taken it back the room after breakfast, as I had taken a photo of the view from our window. Still, I was still ever so relieved to see the little beast, charging next to my bed. This is a situation my darling phone would find itself in for much of the next few days. 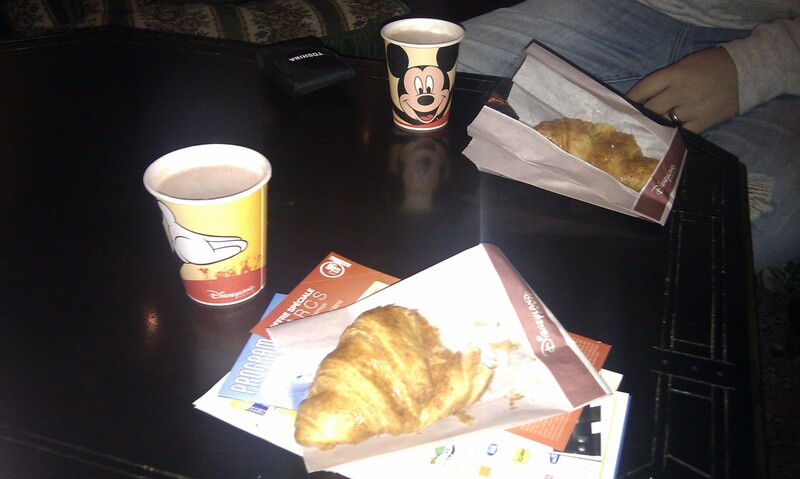 Senior moment over, we got ourselves ready for the day ahead, and headed for the parks. The bus service to the park was (as it was all weekend) pretty good, and we were soon on our way. Upon arrival at the main entrance, the weather was the worst we would see all weekend, with a light drizzle. 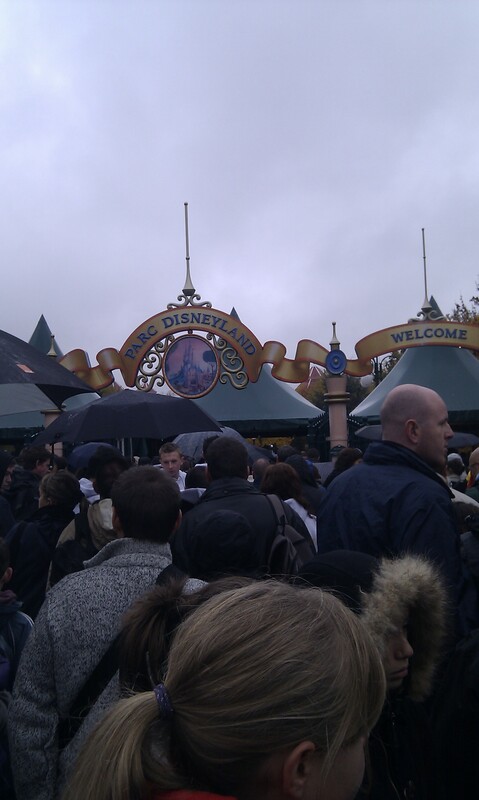 However, the weather was nowhere near as grim as the queue to get in. A huge crowd was congregated, slowly inching its way to the bag check. It turned out that we were through it in a few minutes so it was not as bad as it looked. At this point we needed to convert Adam’s magic letter to actual park tickets, so we joined the horrific looking queue at the Guest Services windows. There were only three of them, which would have been OK if they were just used for queries etc, but they were also being used for normal sales, despite there being about three hundred other sales windows ten yards away. I would say we waited here for about an hour, with the star of the show being an Italian chap who occupied one of the windows for at least forty minutes all by himself. I obviously could not understand what he was discussing as I understand neither French or Italian, but I did feel quite a bit like punching him in the back of the head. Finally after sorting our tickets, Adam suggested we go into Mickey’s Salon. Having no real idea what this is I of course agree. It turned out to be a special place for shareholders. It is a beautifully decorated room, with free hot and cold drinks, and the odd croissant, so it would have been rude not to partake. Anyway, with all this waiting around, it was hours since we had last eaten anyway. For me, it was at this point that things started to feel a lot like Disney, probably for the first time. Ironically, this experience is not available in Orlando for shareholders, for long complex reasons that I will not trouble you with here. So, like a 70’s disco, we were full of hot chocolate, and on our way to do some fun. Ah not quite yet. 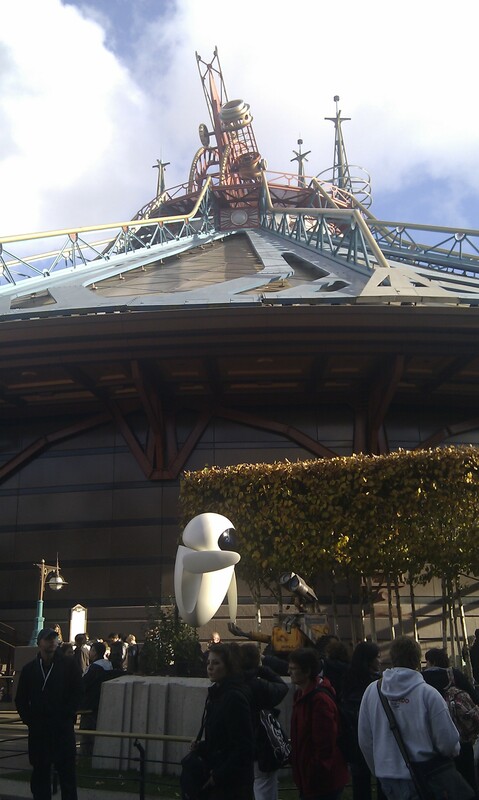 One more stop at City Hall so Adam could pick up our essential VIP fastpasses. Looking at the hordes of folk around me as I waited, it was worth this wait, to avoid much more later on. Now, whether this was Paris or Orlando, nobody was going to stop me taking the traditional first view of the castle photo. OK, so now it was definitely time for some fun type stuff, and we decided to ride Big Thunder Mountain first. Adam flashed the fastpass and we avoided the hour of queuing lesser mortals had to face. The ride itself was, like a lot of this place, strangely familiar yet different. The first thing I did realise was that if you come to Paris in the seriously cold months, then a couple of rides like this would see you picking ice out of your eyelashes. The wind chill factor took the temperature down a lot, so a balaclava would be essential kit in February! We then wandered across to the Indiana Jones ride, and again from the special fastpass line, we boarded very quickly. I was mildly surprised to see that this ride went upside down, but coped manfully, and my warnings to Adam about my world-renowned coaster Tourette’s, were largely redundant. 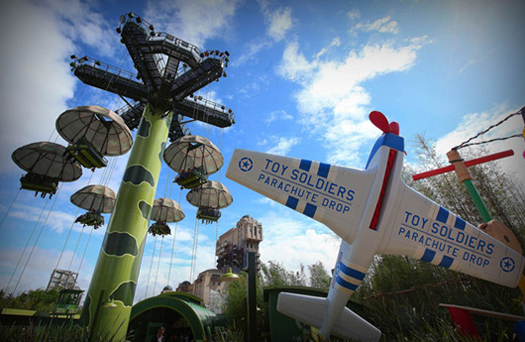 There were some rides that didn’t have fastpass. After lodging my formal and official complaint about this we queued for Pirates for about thirty minutes. This seemed to pass fairly quickly, as it was constantly moving and we were chatting away about….well, Disney stuff. As the French might say, quelle surprise. I remembered thinking that this version of the ride was probably actually a little better to the Orlando version. It felt longer (not that this is a guarantee of satisfaction of course! ), and somehow more logical in the story line, although much of the ride is pretty much identical to its US cousin in many respects. 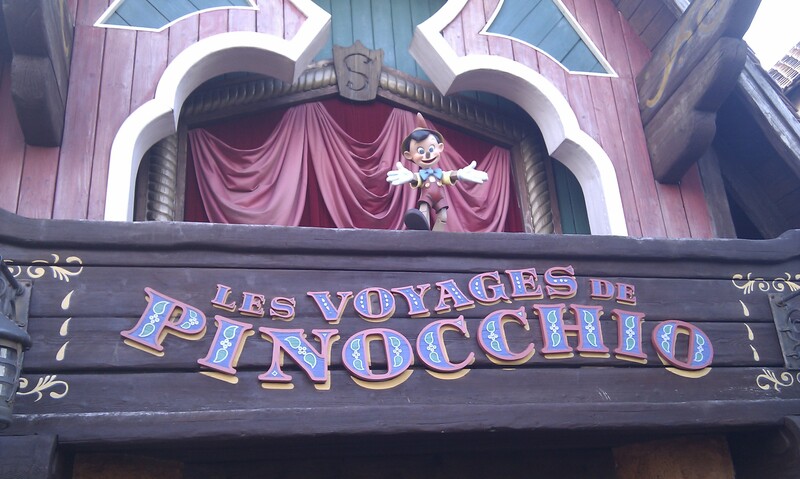 We then found ourselves in Fantasyland, and knowing that most rides here were aimed below our demographic, I still decided to queue for half an hour for the Pinocchio ride. Well, there is no point coming all this way and missing stuff out! Two grown men waited 30 minutes to ride this! Likewise Peter Pan saw two odd-looking (not old-looking in any way) blokes waiting amongst hundreds of kids, but hey I enjoyed it, and again felt this version slightly superior to the Orlando one. We walked across to Frontierland now. On this note, it was very odd for me not to have a clue where I was going, and not to have any sense of my position in the park. We long since stopped needing park maps in Orlando, so it was a little strange to be following Adam around all day. I think he knew where we were, based on his 35 previous trips!! It was lunchtime now, actually around 2.30pm, and the eatery of choice was the Cowboy Cookout. We joined the line, and waited to order, and witnessed, in the adjacent queue the greatest contribution to Anglo-French relations since Sasha Distel. An English chap approached the French cast member on the till and started to order. However, he was of course using his best slow and loud English so that Johnny Foreigner could pick things up. However, being a part of the modern Europe he must have felt compelled to make some sort of effort to speak the lingo, and so we heard…. “Bonjour, could I have one diet coke and…..erm….deux….erm…..normal cokes”. Genius. Sir I salute you. The cast member, who no doubt speaks at least three languages, just carried on as if he heard this stuff all day everyday, and he probably does! Our double cheeseburgers were huge, and tasty….and huge. 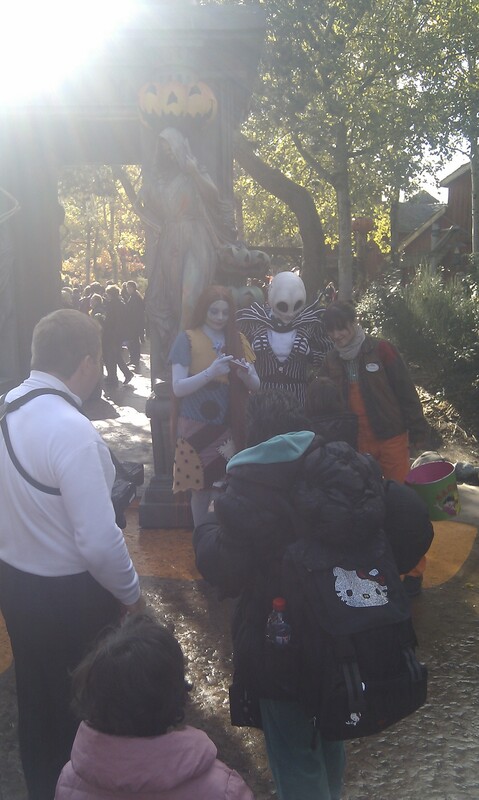 On our way over to Phantom Manor we passed Jack and Sally, and I don’t mean the characters from Coronation Street. The make up for Sally was excellent, and if I put some weight on, Jack’s suit might fit me nicely! 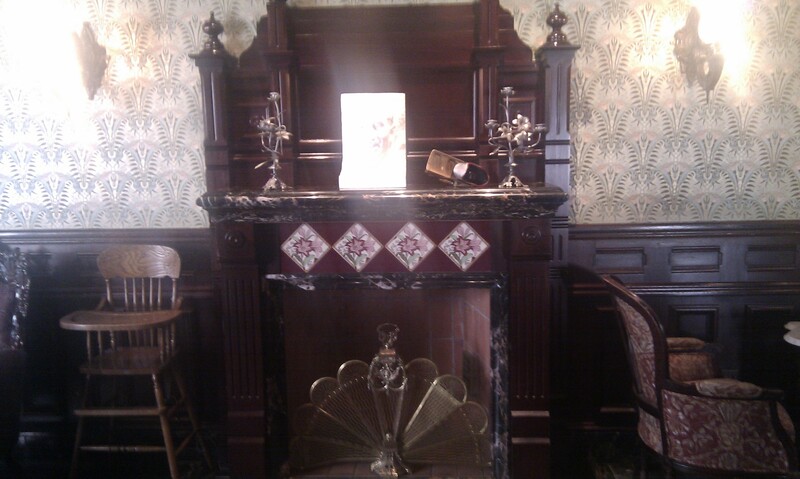 Again, Phantom Manor was a no fastpass ride, so we settled in for a long wait. I think it was posted as a 75 minute wait, but it either wasn’t, or my memory has fooled me into thinking otherwise. 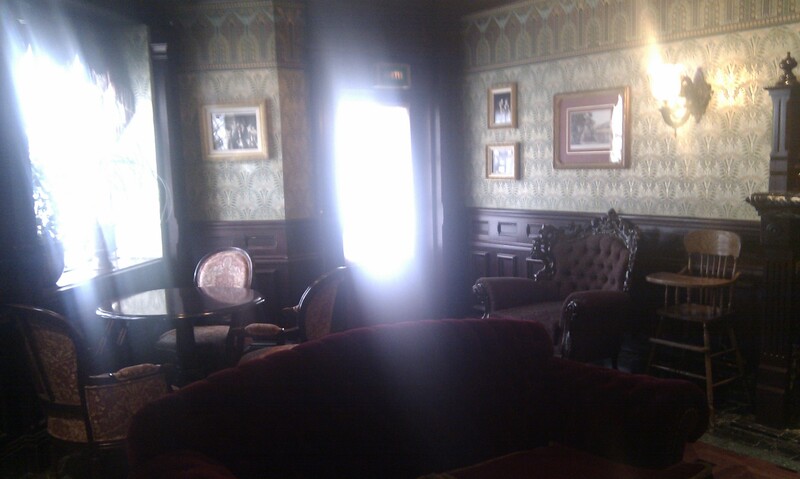 Now, doom buggies aside, this ride is pretty different, and the house itself, to me, reminded me of the Bates Motel. You start with a stretching room type thing, but beyond that there are few similarities between the US and French versions. Both are very good, and both often stop mid ride a lot! At this point we headed over to Space Mountain, which from the outside looks a very similar animal to the one I am used to. Adam warned me however that not much else was common between the two. After a restroom stop in Videopolis, which seems to be a vast auditorium built for a now dead attraction, currently being used to show old cartoons, and somewhere to eat your lunch, we took the fastpass back entrance, and still queued a fair bit. A sign of how busy the parks were today. Once at the point of boarding, it quickly became very clear that this is a VERY different ride. The fact that we got into a Rock and Rollercoaster style carriage with full on pull down restraints gave me a big clue that I had better take my glasses off for this one! It was a wise move. It started like the Hulk, and I spent the next few minutes teaching the French some English swear words! A great ride though. At this point, it was coming to the time that Adam had arranged to meet up with some of the cast from the Buffalo Bill show, for interviews for the Podcast, so we made our way out of the park. Back at the Village, we waited a while outside the show, having a welcome sit down, and eventually Buffalo Bill (Trent) and Annie Oakley (Lesley) came out to see us. After brief intros and chatting, Adam whipped his microphone out, and launched into his interview, and I just loitered a bit trying not to get in the way. They were both very lovely, and treated us both to a back stage tour of the arena. We shook hands with most of the cast, walked behind too many horses for my liking, and had a look at the buffalo too. They are pretty big! Complete with our cowboy hats and tickets for the show we made our way front of house to mingle with the muggles now entering, and we watched the pre show in the lobby before going up to our seats in the arena. At this point, we say goodbye to my phone (and therefore camera) for most of the rest of the weekend. The food and drink were brought out almost immediately, and we take on board some welcome beer, and some pretty nice Chilli. I also had some (if not all) of the corn bread on offer! 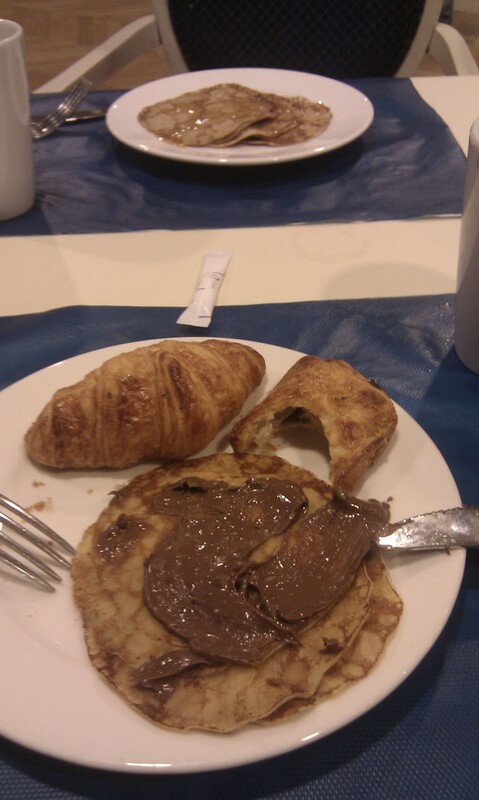 The rest of the savoury food wasn’t the greatest, but I guess this is to be expected at an event of this scale. The crumble to finish was nice though and we both made short work of that. The show itself is based on the central sand arena, with lots of horse trickery, a section of songs including a few Disney characters, and it ends with a set of rodeo games that pit four different sections of the audience against each other, as we each cheered on our respective players. Good fun! We left the show and headed for the bus. We were quickly back at the hotel, and in the room preparing for the Terrorific Night 2 at the Studios. This involved the addition of a few more layers of clothes, for me, a thicker warmer hoodie, an attractive hat, and gloves. Being two males this took us a matter of minutes, and we were back on the bus at 8.50. Once at the studio gates we had the same organised chaos to get in. Having no bags, surely we could have simply walked through the no bag entrance? Alas, there wasn’t one, so we jostled with everyone else for about ten minutes. As we did get in, I was asked by a burly, surly security guard to open my coat, as with my 23 layers of clothes it looked like I was smuggling in a small child. I chuckled, and told him that I was simply fat, not a terrorist. My humour did not translate and I narrowly avoided Le Glove Rubber. All around the park, the atmosphere was superb. Obviously at this point I had not seen the park in normal circumstances, so I could not judge how much work had gone into transforming it. Well, after seeing it the next day, my verdict was, quite a lot! Cast Members wandered the park, mingling with/attacking the guests, in some fantastic costumes. As the posters said, this was definitely an event for those over twelve years old. We saw one Dad rushing for the exit, carrying his young daughter who was quite distraught. Adam did a video of some of the night’s events. Ride wise, we headed for Crush’s Coaster first. A ride unique to Paris, but also with a huge queue. This took around forty minutes, but the ride itself was very good indeed. Again, Adam told me it was very different to normal operations and I had to take his word for it. Anyway, it was a belter! Many of the attendees tonight had dressed up in Halloween costumes, and indeed I had come as a grumpy, overweight, balding UK Dad. Scary enough I think. Next we decided upon the backstage tram tour, which for tonight had been rebranded as the Terror Tram (or something like that). As queues went, this was the Daddy of them all. It took an age, and towards the end we were both tired, cold and in danger of losing the magic a little. Finally we got onto our tram and set off. It all began quite normally, but soon enough the usual pre-recorded patter on the video screens “broke down”, and we had just white noise as we entered Catastrophe Canyon. This was pretty much unchanged, but upon leaving that we came upon a scene from (Adam told me) Dinotopia. If you have watched the video by now you will know that a scene was played out here with a large devil type bloke and his minions. As they stole the young girl from the carriage it did take a few moments to realise the boyfriend was in on it. His subsequent “performance” as he himself then turned into a zombie was truly impressive, and he absolutely frightened to death the young girls sat behind Adam and I. Next, at a London scene, more zombie types appear, only to be chased off by chaps in welder masks at the last moment, who then in turn, also reveal themselves to be “not of this world”. All in all the whole experience was pretty amazing, pretty hard to describe here, but suffice to say, it was easily impressive enough to put all thoughts of grumpiness about the queue out of our minds. Typical Disney! Our next ride was Armageddon, which in effect was “closed down”. Instead we were invited to do a walking tour, which quickly turned into an attack from more deformed types, this time in the shape of aliens. Again, anyone showing the slightest sign of fear was targetted for “ghouling” and there was a lot of screaming and shrieking along the way. Again, really good fun. To finish off the night we ended up in the odd position of doing a couple fo rides in the Toy Story section, on a night of horrors and Halloween. I think this is called a juxtaposition, which I always thought were an 80’s pop band! First we rode the Slinky dog ride, which is a pretty simple merry-go-round type thing for young kids, but we jumped on nonetheless as it had no queue at all. We had no shame! We then did the new parachute drop ride, which was surprisingly more intense than it looked, and a definite tummy tickler. By now it was going on for 1am, and we were both, not to put too fine a point on it, cream crackered. What we really needed then was to have to sprint to jump on the final bus of the night to avoid a forty minute walk back to the hotel. So after a full-blooded Dad run, a red face, and asthma attack, the bus then sat there for ten minutes with us sat on it, heavy breathing. We got off the bus and into bed within moments, and it took me seconds to fall asleep! Another wonderful trip report as always. 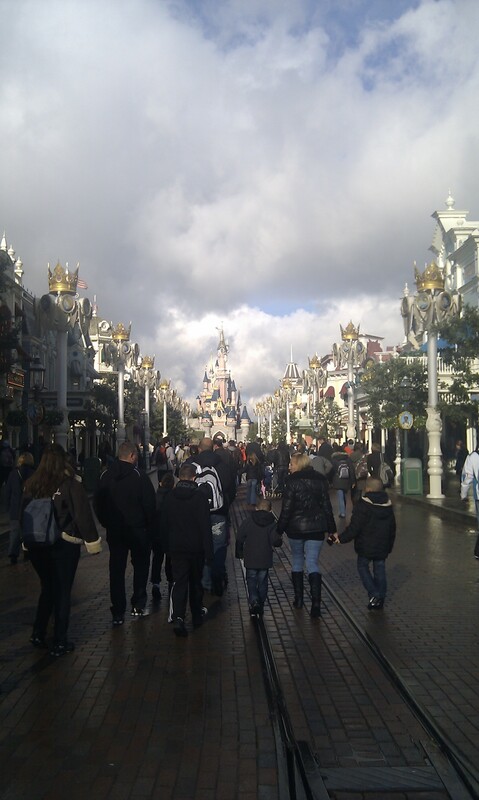 But (there’s always one isn’t there) I just don’t ‘get’ Disneyland Paris. To me it’s always Orlando. Maybe the weather has something to do with though…..
Thats the first time I have read something that made me want to venture over to EuroDisney but the weather and the Frenchness would still trouble me…that and huge multi-lingual, non-moving queues. Un coca de la maison. C’est naturellement. C’est possible?